The Everyday Planner ™ printable planner for 2018 is now available for download! Print, organize, plan and tackle goals like never before. Turn your wishes into goals and those goals into successes with our tried-and-true system. Yay- it’s that time again! The Everyday Planner ™ for 2018 has launched, and I wanted to share some of the features with you today. While the design is similar as when we launched last year, I’m still so proud and completely in love with the neutral redesign. It has truly been a labor of love, and I can hardly wait to see how the new features that are coming with this release help people balance their daily lives and go after their goals more successfully than ever before. One request that I’ve heard loud and clear is that many people prefer a smaller, half-page option for a planner as well as having the larger full-page desktop version. Well, good news! Now the planner comes with a mini version for the same low price. Now you can try both sizes to fit the different areas of your life! 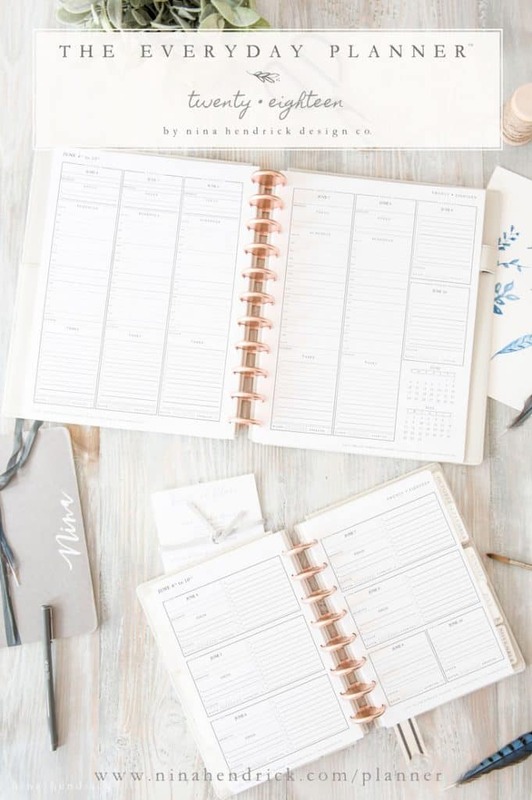 With this planner, I strived to balance all of the things that we try to organize in a day. For most of us, it’s an overlap of family responsibilities, household tasks, business/blogging, health… Based on feedback, I also created more generous weekdays and condensed the weekends. As always, all pages are pre-dated. They include a space below the date for a holiday or special occasion (the planner is pre-filled with Major & US Holidays). The Important section can be used for your biggest reminder of the day- if I don’t have anything big due, I fill it in with an encouragement. The Focus section highlights the top three things you need to accomplish in a day. 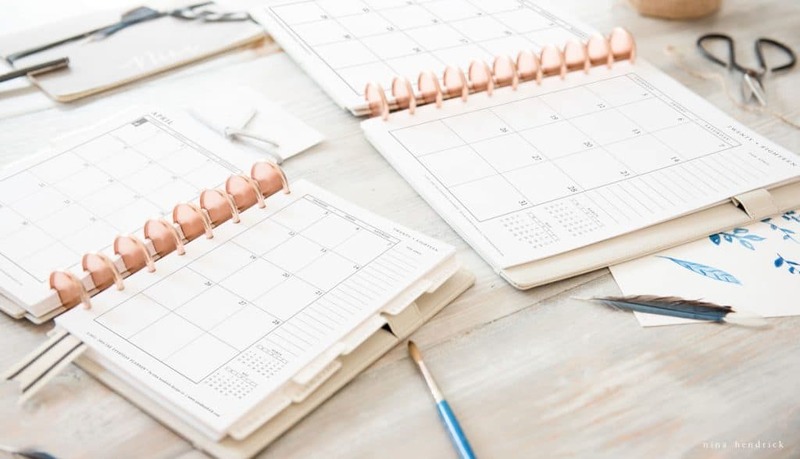 The Schedule is your time blocking section, with spaces for early and late appointments or tasks. The Dinner section coordinates with your meal planning, so you always have a quick reference. The Tasks section is your to-do list. Transfer anything that doesn’t get accomplished one day into the next! The Health section is a great way to track your water intake and exercise. While some days they make me cringe, I know that they are as important as everything else in my life and I need the reminder! I was shocked by how much more I was pushed to stay on track when I began seeing these reminders daily. Condensed Weekends feature a spot for special occasions and holidays, to-do list, dinner, and health. Feedback from last year’s time blocking planner informed me that the majority don’t need a schedule on the weekend, and I completely agree! At-A-Glance calendars show the current and following month. I also wanted to show you the weekly spread for the Junior size of the planner. I did my best to retain as many of the task management features as space would permit. I have gotten requests for the time slots, but with a weekly planner of this size, it simply isn’t practical. The monthly pages retained their classic layout. I have always received great feedback on the calendars, and I love them myself- there’s no reason to mess with a good thing! The one small thing I did change was to make the calendar lines bolder, per your request. 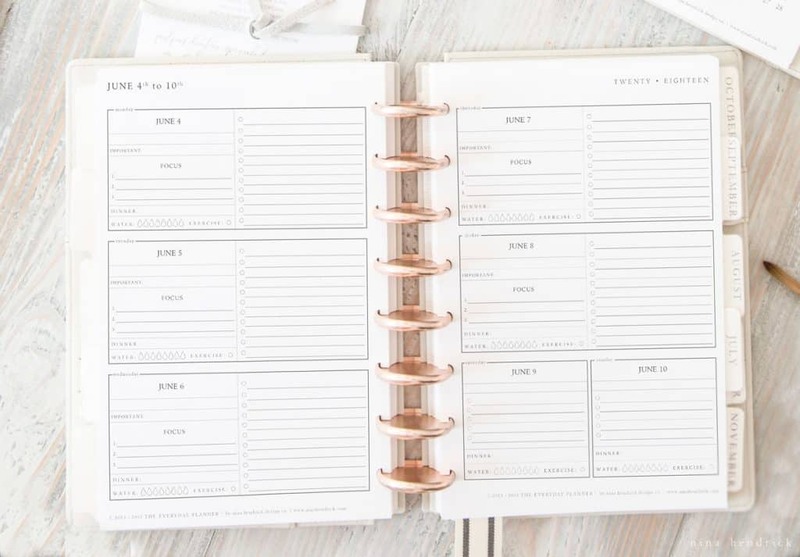 Both sizes of the planner feature the same monthly design (the junior planner is shown here). I have had so many “goals” in my life that (if I’m being honest with myself) were actually just abstract wishes. I thought to myself “I’d love for this thing to happen!” but that was where it ended. It wasn’t until I developed an actionable plan that those wishes became true goals and then were able to be accomplished by completing the steps I had outlined. Without fail, my biggest successes can be attributed to detailed plans. 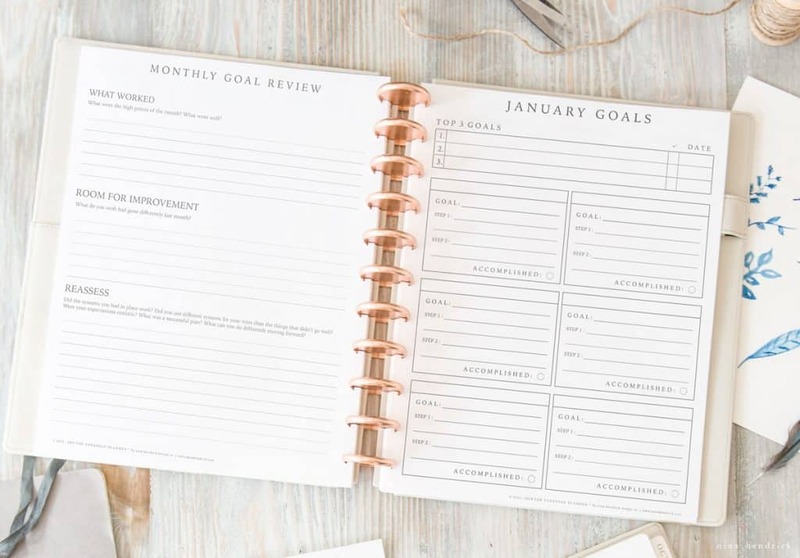 These new goal worksheets at the beginning of the year and each month help you turn your wishes into goals, and by outlining the steps along the way- you can turn those goals into successes. Each heading is customizable in Adobe Reader (and there is a video included that shows you exactly how to customize). I’m so happy to share that we also have add-on Printable Blogging Pages for the planner. 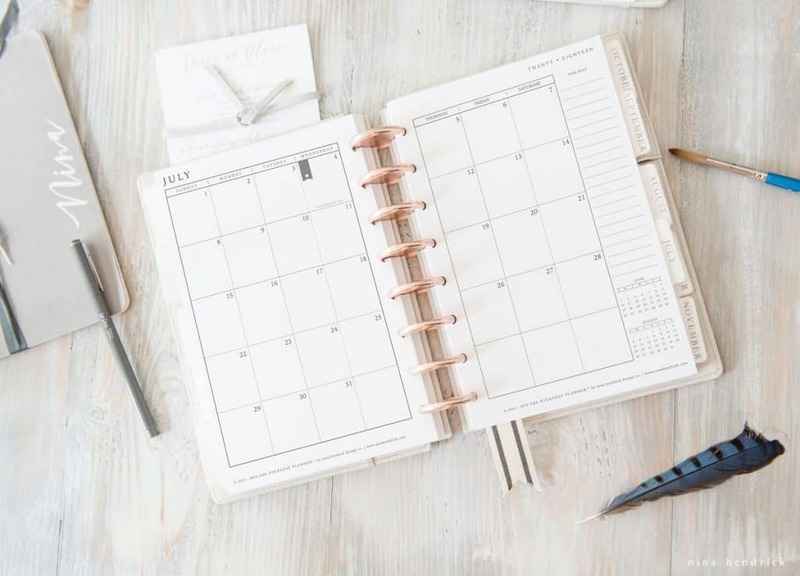 These pages include 20+ blogging-specific worksheets and tracking sheets, and a handy guide on how to best plan your editorial calendar. With one purchase you receive both sizes of the add-on pages, full-page (8.5 x 11″) and half-page (5.5 x 8.5″).My intention is that this will help you achieve blog/life balance like never before! Please note that these pages are the same as last year, so they do not need to be purchased again for 2018. This product does not include the base planner, which is now sold separately. PLUS any future updates to the planner will be sent to you if you remain on the mailing list. 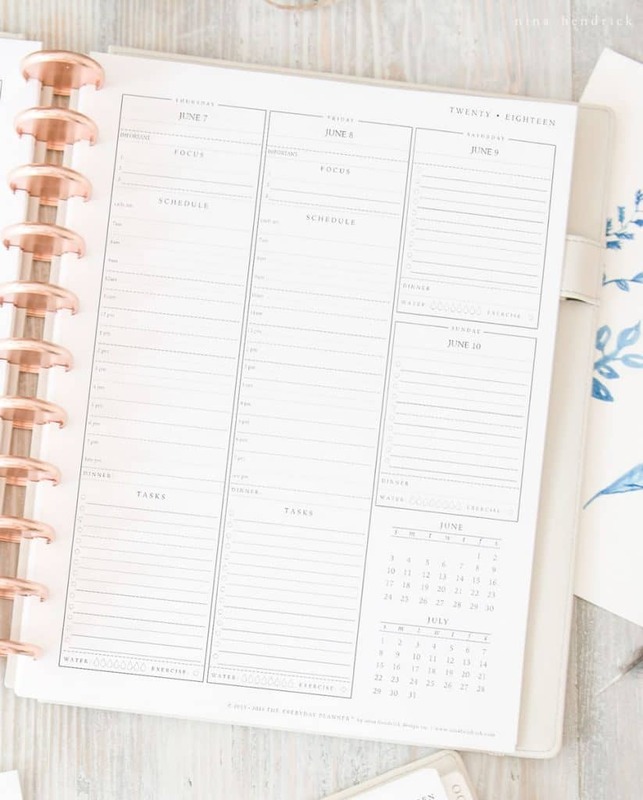 As with all of the previous versions, this planner is a printable PDF- which means that you won’t be mailed a planner, but rather you will be emailed a digital product. This year I’ve included videos to accompany the Getting Started Guide, one of which shows you how to print the planner step by step. Like I mentioned above, some of the fields are customizable in Adobe Reader, but due to the design updates and updates to Adobe Reader itself, there are fewer editable fields than previous editions. An included video shows you how to add text anywhere in your planner before printing. Before we go, I feel like I may need to address the neutral design! I know this is a big change from the original, and change can be hard- but for many reasons, this is the best trajectory for this planner to take for the future. There are several reasons I decided to go with a dark gray and white design. First and foremost- I have been on a journey of discovering my brand over the past couple of years. Through that process, I discovered that my brand is most definitely neutral, and I want my products to reflect what inspires me. Instead of being overwhelmed with bright colors, it’s so much more refreshing to have a blank slate for planning. I have received many many requests for neutral design over the years- especially from the guys! I’ve also received quite a lot of feedback over the years regarding the use of ink. This new design will certainly save money on ink, and make printing services more reasonable than ever before. Getting Started Guide with my favorite tips for using the planner & printing instructions. Access to video tutorials that share instructions, as well as some fun extra features of the planner- like adding custom text! Phew, I know that was a lot of info, but hopefully, it was all useful! Please feel free to leave any questions you may have in the comments! You can read more here about how I assembled my planner this year and which materials I used. Oh, you are so much of my personality! 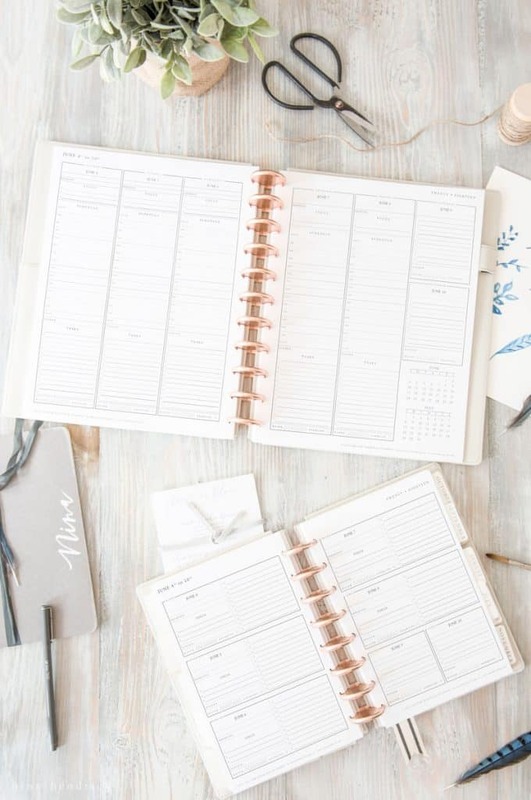 Your EveryDay Planner is exactly who I am and what I am looking for. Thank you for its neutrality, focus, and clean lines. I need a lot of calm and clarity in my life. All those planners with those rainbow colors – is too much for me. Hello! What is the difference in the Blogger Edition? The Blogger pages are an add-on, undated, and includes worksheets that can be used year after year! 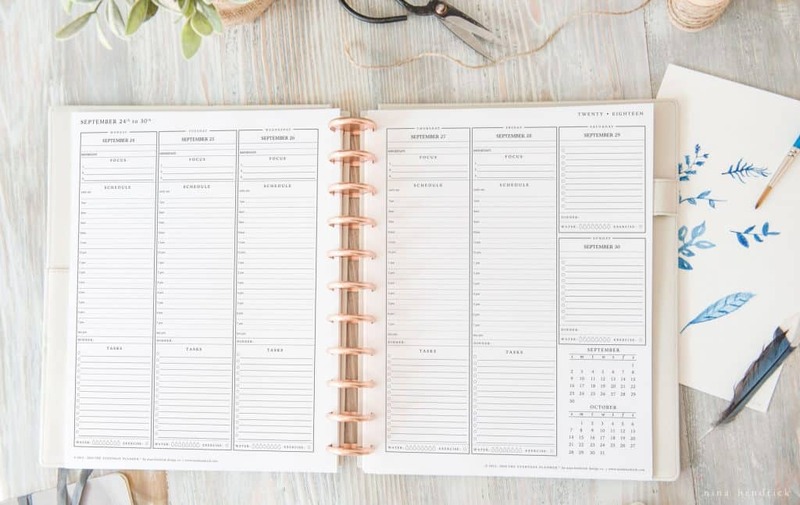 The base planner contains the calendars and schedules. Can the same hole punch be used for the junior planner? Yes! There are sliding brackets on the punch that show where to line up the half-sized pages. I couldn’t be more excited to stumble across your website…it’s a true inspiration and absolutely loved the way you summed it up by saying “ It’s a labor of love”. Simply Perfect!